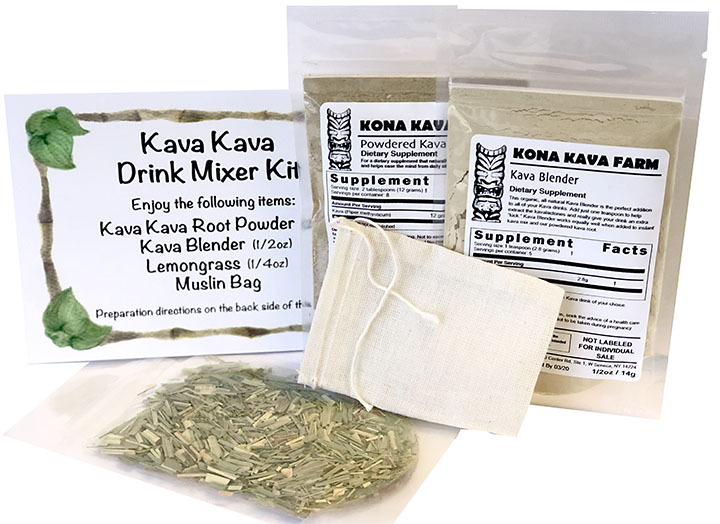 Perfect for your Kava start, this Basic Starter Kit includes our best kava Root Powder (2oz), Kava Blender (1/2oz), Lemongrass (1/4oz) and Muslin Bag. Our Kona Kava Kava Kit is a great place to start if you are just getting into kava. We have done all the hard work for you, and assembled all the ingredients that make up a 2-person serving of our favorite kava kava recipe. This includes our best kava Root Powder (2oz), Kava Blender (1/2oz), Lemongrass (1/4oz) and Muslin Bag. If you’re not sure how to go from powdered kava root to delicious kava drink, this kava kit also comes with detailed instructions which walk you through how to incorporate all of these ingredients into your kava drink. This kits is awesome. It comes with what you need to make a batch of kava. Everything is already measured and packaged, all you got to do is follow instructions and bam!! you got a batch of kava. I like to order this every now and then because its easy to make and it comes with everything. I would drink a bowl full of this batch every night before bed. This kit makes about a full weeks worth of kava, from my perspective and depending how much and how often you drink kava. Drink the batch often because as the week passes by the kava feels like it losses its potency, well to me it feels like it does. It’s better to enjoy this batch within the week of making it , for a stronger beautiful kava experience. Thanks for the thoughtful reviews! Consume your kava as soon as possible for maximum freshness. Great piece of advice!